For those who might not have discovered it yet, Linguee is a web-based tool for searching previous translations. Linguee is currently available in English<->German, English<->Spanish, English<->French, and English<->Portuguese. According to the website, Chinese, Japanese, and other languages will follow soon. I was first told about it by a German translator a couple of years ago who was really excited about its possibilities, and started to dabble in using it myself as soon as French was added. There are many entries from eur-Lex and Europarl, for example, so it is quite useful for the legal field, and although reliability of terms is not perfect, you can certainly get some good ideas from Linguee. Quality of results has improved dramatically since I first started trying it out, and will hopefully continue to improve – depending on the sources of course. It is also good to see words in their contexts. As you can see from the screenshot below, it’s very easy to see the URL where the text extract comes from – by clicking on it you are taken to the source and can check it more thoroughly if you wish. There is a simple dictionary entry on the left-hand side of the page, which is of limited use when searching for more complex terms than the example below. The highlighting of the two terms (in blue above) isn’t always perfect – I suppose it’s done automatically – but in most cases it works, and speeds up skim-reading the entries. You can also install plugins to search Linguee directly from your browser or even from any program on a Mac (see “Tools” on the top menu of the website). 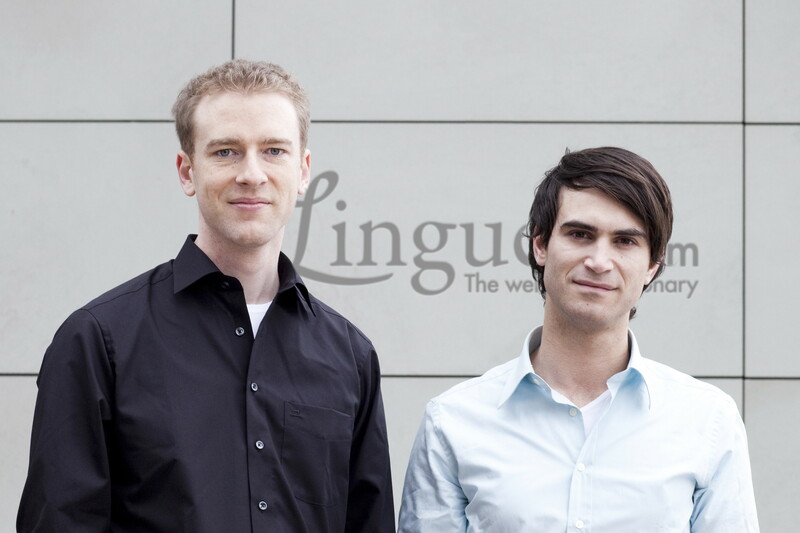 Linguee was developed by Gereon Frahling and Leonard Fink. Linguee GmbH was founded in December 2008. 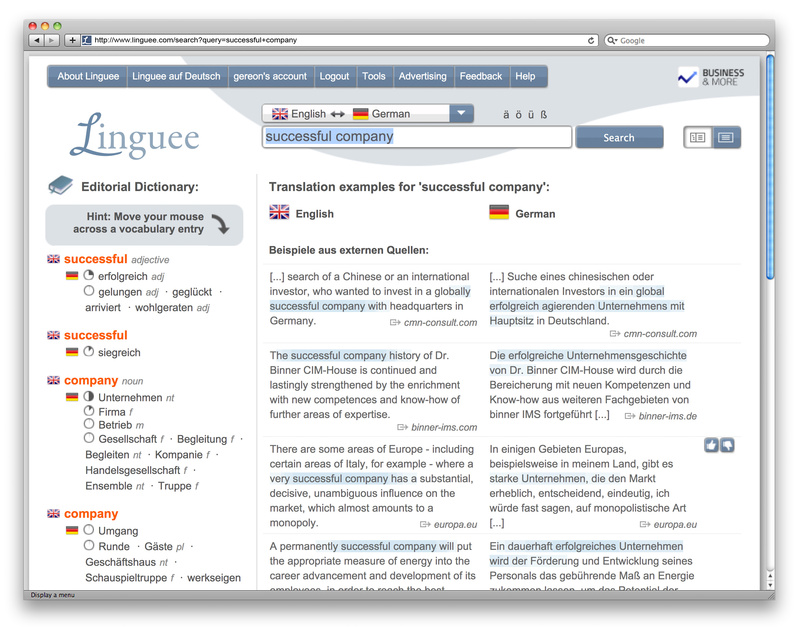 After a one year open beta phase, Linguee was officially launched in May 2010 for English-German. Among Linguee investors are the co-founder of Alando, Jörg Rheinboldt, and the Switzerland-based BrainsToVenetures AG. Look out for posts on two similar tools coming soon! « Translation and interpreting jobs at EU – apply now! I absolutely agree. It’s a very useful tool and it’s design and layout make it super easy to use. I am a lawyer/freelance legal translator and use Linguee quite a lot. In particular I like the various translation suggestions it offers. It\’s a great tool to doublecheck my work after completion too. Linguee is a great resource but should be used carefully: the translations are not always perfect. I find that it is a good way of determining how industry-specific terms are translated by seeing what the majority of the websites are using. I do agree – as I said – not always perfect but a good source of ideas (like most terminological tools actually).